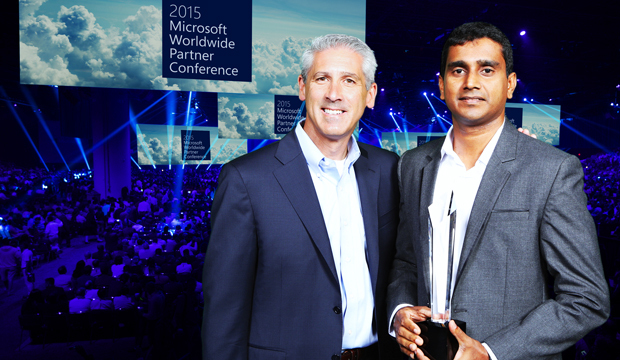 Leading financial software and technology solutions provider MillenniumIT received the Microsoft Country Partner of the Year 2015 award at the recently held ‘Worldwide Partner Conference’ in Orlando, Florida. MillenniumIT was honoured among top players in a global arena for demonstrating excellence in innovation and implementation of customer solutions using mobile-first cloud-first based Microsoft solutions. Delivering mission-critical solutions in Cloud, data-centre and server environment provisioning, monitoring and administration, MillenniumIT supported the 1st Azure Enterprise Agreement (EA) in the country. Microsoft Technology Specialists at MillenniumIT have gained the necessary knowledge and experience to provide cloud-based solutions for many enterprise level business scenarios. These include Migrating ERPs and mission critical, complex databases to the Azure platform. Working with Microsoft’s mobile-first cloud-first platform, MillenniumIT powered many companies during the past year; both locally and overseas. This platform connects mobile phones used by employees to the companies they work for through Microsoft’s tools, thereby diffusing the compartmentalisation of business and consumer, and facilitating a truly bring-your-own-device (BOYD) environment. MillenniumIT’s team possesses many years of cumulative experience in Microsoft Office 365, gained through supporting Sri Lanka’s largest EA customer. Deep technical knowledge in these Cloud-based technologies enabled MillenniumIT’s team to successfully migrate a complete IT infrastructure eco system of a large enterprise to the cloud with Azure and Office 365 recently. MillenniumIT also has a strong practice in Office 365, and the skilled and certified engineers and pre-sales engineers to support cloud solutions in both Azure EMS, and Office 365. They also implemented the 1st Oracle DR solution in the country for a large automobile company. MillenniumIT is also a Microsoft Licenced Solution Provider in Sri Lanka. About MillenniumIT: MillenniumIT is the power behind world financial markets. Its advanced, proven, ultra-low latency technology has transformed markets and the organisations that participate in them, from trading venues to banks, broker dealers to post-trade institutions to industry regulators. MillenniumIT’s Systems Integration Business provides a host of specialised, scalable solutions ranging from Core Infrastructure, Information Security, Business Collaboration, Near-Field Communications, Business Productivity, Managed Solutions and Customer Relationship Management. Long-term partner for more than 40 financial institutions and financial services clients across the Americas, Europe, APAC and Africa, MillenniumIT invests heavily in radical technological innovation to give clients a competitive advantage. With 800+ professionals specialising in state-of-the-art capital markets technology, MillenniumIT's pre- to post-trade, multi-asset, ultra-low latency, agile solutions provide a reliable, scalable, flexible and cost-effective technology infrastructure to meet –- and evolve to maintain meeting –- the changing needs of its global clients. Founded in 1996 and head-quartered in Sri Lanka, MillenniumIT was acquired by the London Stock Exchange Group in 2009. Since switching to MillenniumIT technology, the London Stock Exchange has enjoyed significant improvements in latency, a 400% increase in order-execution capacity and a notable reduction in cost. About London Stock Exchange Group: London Stock Exchange Group (LSE.L) is a diversified international exchange Group that sits at the heart of the world's financial community. The Group can trace its history back to 1801.